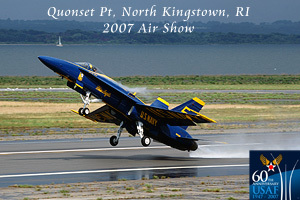 Quonset Point airport has been holding the Rhode Island National Guard Open House for 15 straight years. The show is a big contributor to local charities raising over $1 Million dollars with Hasbro Children�s Hospital receiving over $900,000 to date. With last years show being a total wash out, the charities, the Guard and the air show enthusiasts where looking forward to this years show. The weather gods were in good terms this year as the forecast called for mostly sunny skies with temps in the upper 70�s. I�ve been making the Friday trip to catch the arrivals and practices for a few years and this year would be no different. I started the morning out at 7am on the ramp to capture any static�s that had already arrived. Most of the demo aircraft where already parked on the Hot Ramp including the Blues, F-18 EC Super Hornet team and the acrobatic planes of Sean D Tucker, Michael Mancuso, John Klatt. Mike Goulian, Matt Chapman and new guy to the RI show, Michael Hunter. The Blue Angels were prepping for their media flight of an anchor from local Channel 6. After watching his footage that evening, he handled himself very well for receiving 6 G�s. The L-39 was also taking up local sponsors making room for some of the static�s to start arriving. A F-15A from the 102nd FW at Otis ANG came in first. The Super Hornet took center stage for his morning practice. When he was finished a C-23 Sherpa took off with the US Army�s Special Operations Command team known as the Black Daggers. They would be taking their first practice jump at 6,000 ft.
Once the Daggers and Sherpa had landed they allowed for some more arrivals to come in. First in was the F-15E Strike Demo team from Seymour Johnson. A T-6A from Randolph arrived followed by a Navy Seahawk and a Canadian Griffon. 2 Super Hornets arrived from VFA-22, one of them being the CAG aircraft. Fat Albert was next to come in after making a trip down to NAS Oceana for an engine swap on Blue Angel #3. Sean Tucker took the practice box next followed by the Strike Eagle team, which gave people a fantastic show. Mike Goulian, John Klatt, Matt Chapman and Michael Mancuso all took their turns in the demo box. The C-130J demo went up followed by Michael Hunter in his �Fight for Diabetes� sponsored Laser 230. Michael wears an Accu-Check device to monitor his blood level. The Blues were up next for their practice. You could see off in the distance a cell coming our way. The Blues ground crew donned their rain gear and covered the communications box as the 6 aircraft taxied by getting weather reports. The Narrators, #�s 7 & 8 were on the box ready when the rains came in sideways and they had the Blues sit at the end of the Alpha taxiway until the weather passed 10 minutes later. The ground crew needed to make sure the weather was clear in a 5-mile radius for the program. With the rain and clouds off to the South, and the sun showing here and there it made for some great take off shots with vortices from the diamond take off. #5 took off next from the wet runway pulling some vapor but the trailing smoke giving a steam effect left on the runway. #6 took off the opposite way and once he got over the bay pulled up where the thrust of his engines could be seen on the ocean. The rest of their show went off clean. Friday night there was a demo down at Narragansett Beach with the 2 Super Hornets, a C-130J and the Black Daggers and Sean Tucker. Saturday�s show started off with the Black Daggers and the American Flag. Sean Tucker went up with the C-23 and while they were climbing for altitude, Sean would come up tight to the back of the Sherpa for some photo ops. Once the jumpers were ready he would circle them as they spiraled to the ground. A KC-135E from the NJ ANG came in to pick up some media people and bring them up to refuel the F-22 Raptor coming in from Langley AFB, VA. Once the tanker departed, Les Shockley in his jet truck raced John Klatt down the runway. 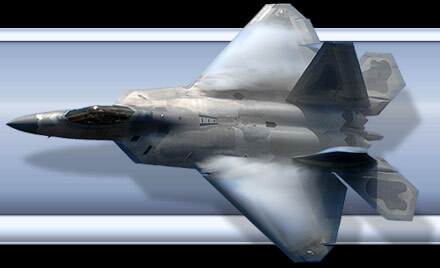 The Raptor was called in for his demo but Max had to scale it back due to an engine AB warning light. Even with him taking it easy, he put on a great demo. I was amazed to hear the large crowd applauding so many times. The Heritage Flight went up next; because I was going up in a UH-60 for the Combined Arms demo I wasn�t able to photograph this flight. A few of us were taken to a grass field North of RW16 where they had 4 Blackhawks & 2 Hueys. The first 2 Blackhawks were going to have troops in them. The Combined Arms demo is a mock battle to take an airfield. The aircraft involved are 2 A-10s (from the 104thFW), 2 C-130J�s from the 143rd AW, a C-23 Sherpa and the helos. While the 2 C-130�s and 2 A-10s departed from RW16, the 3 Blackhawks and 1 Huey departed from our LZ over the trees and headed SW over the bay. We did 3 racetrack patterns waiting for the call to come inbound. This year they didn�t have the funds to have the pyrotechnics due to the light attendance from last year. On our first approach we landed on the runway to let out troops to �take the field�. As we departed a C-130J would do a mock drop of supplies while another landed and a Humvee drove out the back. Fat Albert performed his JATO take off on Saturday only due to the low inventory of JATO rocket bottles. The Blue�s performed flawlessly both Saturday and Sunday. Due to the dry weather on Saturday & Sunday, there wasn�t much vapor being pulled even on the high speed passes. I would like to thank the 143rd AW and the RI ANG PAO Lt Col. Riel for all their hospitality at this years show. I�m looking forward to 08 already!